Something frightfully exciting is taking place this evening at Dr. Gloom’s laboratory! He has invented a machine that will bring to life amazing new creatures that the World has never seen! Through SCIENCE, Dr. Gloom can alter the age of his creatures just by throwing a switch. While it would be horrific to let the creatures escape, Dr. Gloom feels really good about his chances of winning the Mad Scientist of the Year award! Oh, and he’s put you in charge of the lab WITH the creatures. 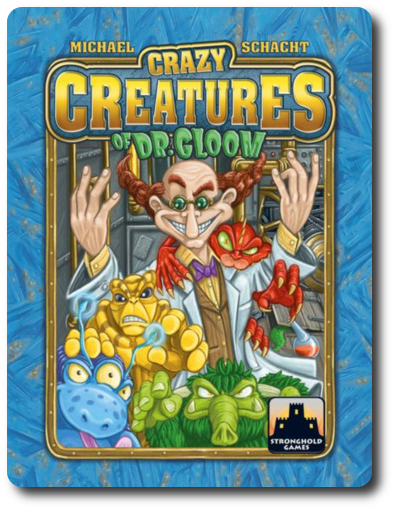 Crazy Creatures of Dr. Gloom, available from Stronghold Games under license by White Goblin Games, is comprised of 48 Creature Cards and 4 Machine cards, for a total of 52 cards. 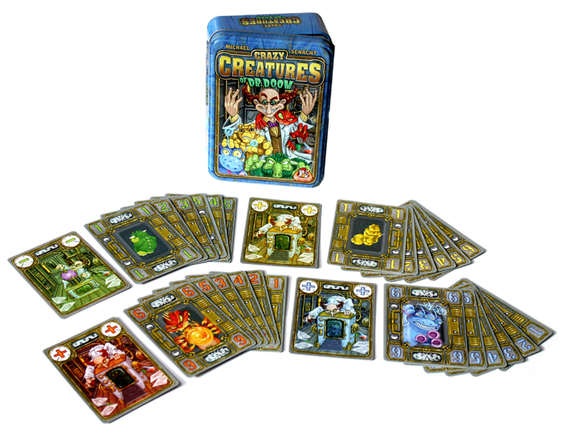 The Creatures cards are further divided into 4 different colors (red, yellow, blue, and green) and are numbered 1 through 6 (twice in each group). The Machine cards are one color each (red, yellow, blue, and green) and are double-sided with a plus (+) on one side and a minus (-) on the other. The cards are of standard quality for most card games and have very colorful artwork of cartoonish creatures and a mad scientist who looks…well…mad. It is worth noting that the smaller the number, the smaller the creature is portrayed in the illustration, suggesting the creature’s age. As the number value increases, the creature grows, going from a baby creature to an adult creature in their creature cage. The entire game is stored and fits nicely in a tin box with a hinged lid. Neat! Not included in the game, and necessary to play, is a pen or pencil and piece of paper to write on to keep track of the players’ points. To set up the game, first find the 4 Machine cards and place them in a row in the middle of the playing area with their plus (+) sign side face-up. Second, shuffle the Creature cards and deal out 10 cards to each player if playing a 4-player game or 12 cards to each player if playing a 2 to 3-player game. Players should pick up their cards and look at them, but keep them hidden from their opponents at all times. Third, deal 8 Creature cards face down to create the Creature Reserve deck. This deck is placed to one side of the playing area and within easy reach of all players. Fourth, any remaining cards are removed for the duration of the game. That’s it for game set up. Determine who the first player is and begin raising creatures in the lab! The game is played in a number of rounds equal to the number of players in the game. For example, a 4-player game would include 4 rounds of play. During a round, players will take turns in sequential order playing cards until the round is completed. On a player’s turn, they will attempt to play a Creature card to a Machine card that is the same color as the Creature. The catch is that the Creature card’s number must correctly match the rules enforced by the Machine card’s mathematical operation. If the Machine card shows a plus (+) sign, the Creature card’s number value must be equal to or higher than the previously played Creature card’s number value. If the Machine card shows a minus (-) sign, the Creature card’s number value must be equal to or lower than the previously played Creature card’s number value. If the Creature card is the first one played to the Machine card, it can be any number value. There is one exception to the above rule. Some of the Creature cards have a genetic mutation (identified with a genetic mutation icon on the card) that allows it to be played on a Creature card with the same symbol and color, ignoring the plus and minus value of the Machine card. The color of the Creature card and the Machine card must match, however. If a player is ever unable to play a card to one of the Machine cards, they lose their turn. After playing a card (0r not playing a card), the player’s turn is over and the next player going clockwise takes their turn. This is repeated until the round comes to an end. The round ends as soon as any player places their last Creature card from their hand. All other players get to take their last turn. A round can also end if all the players pass (meaning no cards can be played to the Machine cards). Players now count their penalty points using the cards they have left in their hand and record them. 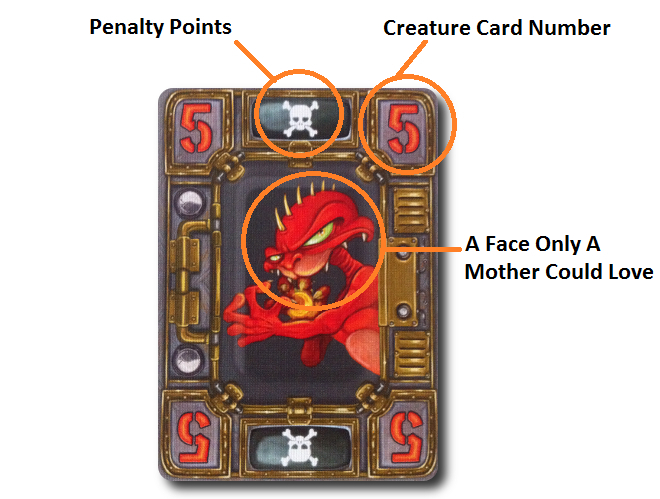 Every Creature card will score 0 to 2 penalty points, which is determined by the number of skull and crossbones listed on top and bottom of the Creature card. For example, if the player has a total of 5 skull and crossbones in their hand, they score 5 penalty points. Any player who doesn’t have any cards in their hand at the end of the round (played all their Creature cards to the Machine cards) subtracts their total penalty points earned so far by -3. A new round now begins if the total number of rounds played does not equal the number of players. Complete the game set up as noted above. All scores from the completed round and subsequent rounds are totaled for each player. After a number of rounds equal to the number of players have been completed, the final score takes place. The player with the least total penalty points wins the game! After playing the game a number of times, our groups adopted several house rules to slightly change the game play. These were suggested by the Board Game Geek community. Note that these rules are not part of the official release and they are provided here for reference only. 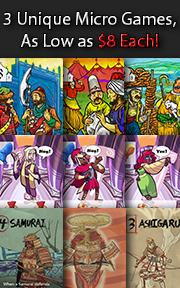 Credit goes to Board Game Geek user Pee di Moor for these variants of play. Optional Card Play: This house rule allows the players to not play a card on their turn. While this puts the player at risk of being stuck with points at the end of the game, it also provided the player with more choice and strategy. This was especially true when more than two players were very close in points and a sneaky card play at just the right time made all the difference. We also observed that some players purposely decided to not play cards to end a round to skunk their opponents with more cards. Forced End Round: This house rule stops the round automatically when any player places their last card. This removes the standard rule of play that allows all the other players one last turn. When combined with the optional card play house rule, this made the game very tense at times. To learn more about Crazy Creatures of Dr. Gloom, visit the game’s web site. Crazy Creatures of Dr. Gloom is not what I would consider a “hard game”. Game play is very straight forward and what a player can or cannot do is largely dependent on what their opponent’s have done before them. This makes the game easy to teach to Child Geeks and non-gamers, because you never have to look much further than the last play to understand what you can or cannot do. But this is not a game you can close your eyes and play, either. I can already see, based off the rules, that the game will require a good bit of logical thinking and hand management. For example, a player shouldn’t play their highest Creature card if they have the same Creature card in a slightly lower value. That would block them out if they can only increase the number values played to a Machine card. Of course, that might be exactly what the player wants to do in an attempt to mess up their opponents. But this is all speculation until we see it played on the table. For the Child and Parent Geeks, I think Crazy Creatures of Dr. Gloom will be a big hit. Fun illustrations and easy game play will draw in the Child Geeks and the Parent Geeks will most likely enjoy the fact that the game has enough depth to keep every one engaged and is not so difficult to exclude anyone in the family. For the Game Geeks, I doubt they’ll endorse this game. 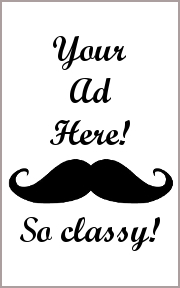 It’s a bit too simple, but they might approve it for it’s fun factor as a light filler. Teaching the game takes all of a few minutes. Do take the time to explain the genetic mutation and the very real need to dump cards that have a lot of penalty points as soon as possible. You don’t want players stuck with cards in their hand they “could have played if you made the rules clearer”. When I taught the game to my little geeks, friends, and family, everyone understood what they had to do and how the game was played. A few questions were asked regarding the Creature match bonus actions, but even these were understood fairly quickly. And so, not being bombarded with question after question, we were ready to play our first game. As my 5-year-old shuffled the cards, I asked my two oldest little geeks what they thought of Crazy Creatures of Dr. Gloom so far. My 5-year-old has put the game in a rather simple context, but he is technically correct. All a player needs to do is play their cards in the right numerical order and match the colors. I have high hopes that my 5-year-old will be able to play this game with some proficiency as the amount of math and counting is very light and he can count to 20 like a Boss. Let’s experiment with the game and see if our test results show beneficial findings or it explodes in our face. The Child Geeks had a great time with Crazy Creatures of Dr. Gloom. They found the game to be fun, fast, and provided just enough challenge to keep them engaged but not stressed out. There were lots of “sighs” and “arghs!” as Machine cards flipped polarity and Creature cards were quickly placed to hold sequential positions, but none of our Child Geeks showed any sign of not enjoying the game from start to finish. The Child Geeks also demonstrated some very smart card plays, but the games always went to the older Child Geeks. While Crazy Creatures of Dr. Gloom is light on strategy and tactics, a player who has strong logical thinking will have the upper hand every time, especially if they have solid hand management geek skills. Regardless, my 5-year-old could play the game very well, which was a huge plus. All the Child Geeks we played the game with had a great time and eagerly approved it. Parent Geeks were also big fans of Crazy Creatures of Dr. Gloom. Even the non-gamer Parent Geeks enjoyed the game and would happily stay seated at the table for another chance to play it. At a peer level, all the Parent Geeks enjoyed themselves, but the creature illustrations were found to be a bit “childish”. Of course, that made the game all the more accessible and delightful at their family gaming tables. When played with the Child Geeks, the Parent Geeks praised Crazy Creatures of Dr. Gloom as an excellent family game that could be taught and played quickly in a causal atmosphere and among friends. 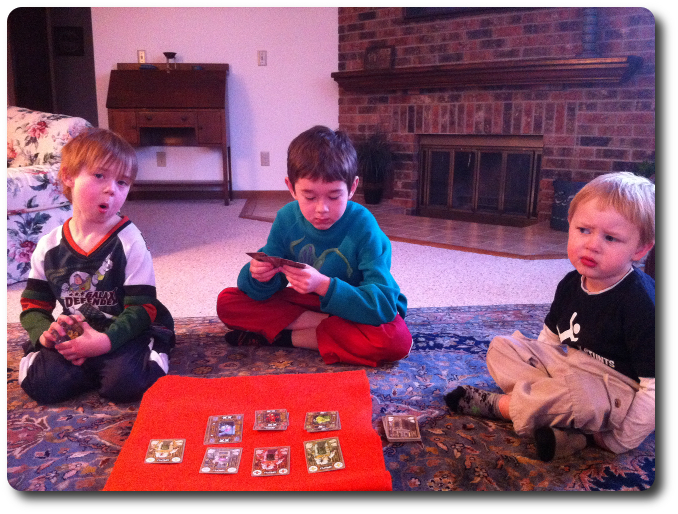 The Parent Geeks were most pleased to approve the game. The Gamer Geeks found Crazy Creatures of Dr. Gloom to be an easy game filler, very light on challenge, and delivered solid game play with little to know real effort on their part to play it. They didn’t have any problems with the game, in fact, but all of them agreed that Crazy Creatures of Dr. Gloom was not a Gamer Geek’s game. To quote one Gamer Geek, “Here is the problem I have with approving this game. It’s a solid little card game and it does it’s job really well, but it is not nearly big, deep, or rich enough to be a game I would think a Gamer Geek would actively seek out.” In the end, none of the Gamer Geeks had anything bad to say about the game, but just couldn’t bring themselves to approve the game for Gamer Geeks. I have no qualms about endorsing this game from a Parent or Gamer Geek perspective, but I was clearly out voted. So while the Endorsement summary at the top of our review and the Final Word from the Gamer Geeks suggests that Crazy Creatures of Dr. Gloom is not Gamer Geek approved, make no mistake that Gamer Geeks will enjoy themselves while playing it. But not for long and that is where the game falls short of being approved by the most elitist of elites. Once you’ve played a single round, you’ve explored the entire breadth of the game. Logical thinking is a must and smart hand management is a given, but most of the game is reactionary. Since the player can only play one card at a time, what they can and cannot do is influenced by what their opponent’s did before them. If they have a sequence of cards that allows the player to more or less “own” the Machine card for a bit, they are set, but there is always the chance that the player’s next planned move won’t be possible. Where does all this put the game? I think it’s a solid filler, a fun diversion, and a great game to play with the family and non-gamers. I didn’t observe anything to suggest that the game wouldn’t be enjoyed by Child, Parent, and Gamer Geeks, but their level of appreciation for it will widely differ. Still, it’s a great game – solid even – and it delivers what it promises: quick and easy fun for everyone!